"Kingdom of Rats, Part 2"
In the Den of Delights, the Turtles quickly dispatch Toad Baron's servants with some nerve pinches, though Toad Baron uses his abilities to make them sick to even the odds. Leonardo calls a truce, saying that they didn't come for a fight, but to talk about the Rat King. At an EPF temporary base Detective Lewis drops Baxter Stockman off with Agent Bishop and the mind-controlled Slash. Bishop demands to know where Stockman sent the Triceratons and Stockman redirects him to talk to his lawyer. Bishop uses both Slash's might and the threat of being sent to Guantanamo Bay to intimidate Baxter into cooperating. At Foot Clan HQ, Jennika reports to Master Splinter about her encounter with the Garden State Wreckers and how both Casey Jones and Hun, working together, helped the Foot defeat the gang. Splinter notices Jennika's seeming infatuation with Casey, and agrees that he is a great ally, but he thinks that Casey trusting Hun might be a mistake. He then orders Jennika to deal with Lupo and his mob. With the city currently in a state of chaos and reconstruction, the Foot Clan is now poised to exploit the situation and become the most powerful force in New York. Back in the Den of Delights, Toad Baron invites the Turtles to a revolting feast (though Michelangelo is unfazed by the meal) so they can talk business. Leonardo knows that Toad Baron and several other Pantheon members are not on board with Kitsune's plot to resurrect their father, the Dragon. He asks for help from some of Toad Baron's like-minded siblings. Toad Baron shows them to a room with eight doors, each of which will take them to wherever his corresponding sibling is (save Chi-You, who remains lost in time and space). However, Toad Baron does not think any of this family would be willing to help the Turtles, so the TMNT huddle up and mull over their options. In New York, the Rat King adds to his collection of hypnotized children by clearing out a ruined orphanage. He proceeds to lead them toward a nearby bridge. And at the EPF base, Baxter concedes to tell Bishop that he sent the Triceratons to Burnow Island. Bishop then suggests an alliance between them; one of mutual benefit. In the Den of Delights, the Turtles decide to call on Manmoth. Donning cold weather gear, they travel through the door and find themselves on a snowy mountainside, where Manmoth is camping. 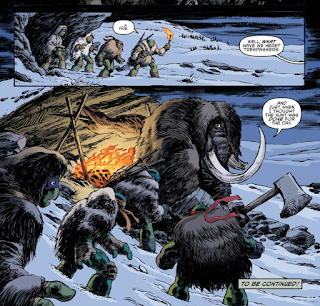 Recognizing the Turtles, he brandishes his ax and prepares for the hunt. 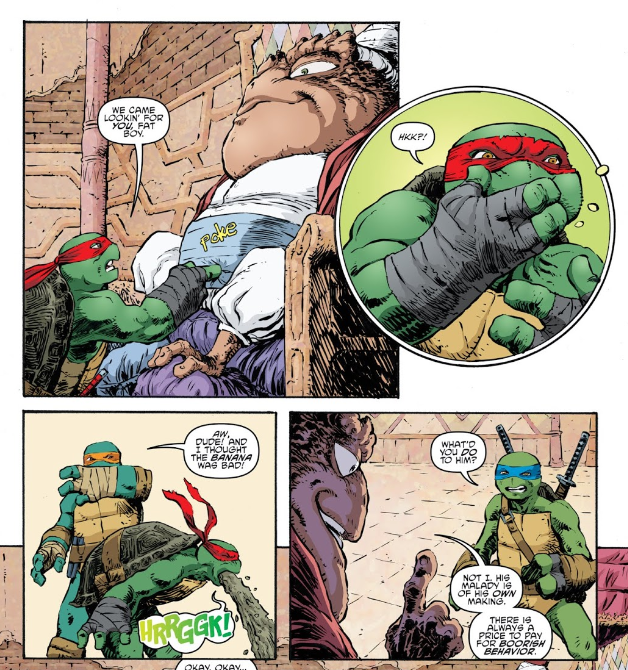 *This story is continued from TMNT (IDW) #81. 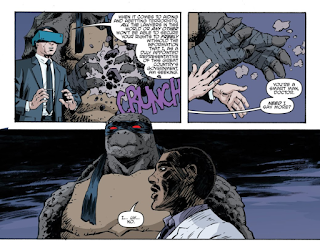 The story is continued in TMNT (IDW) #83. 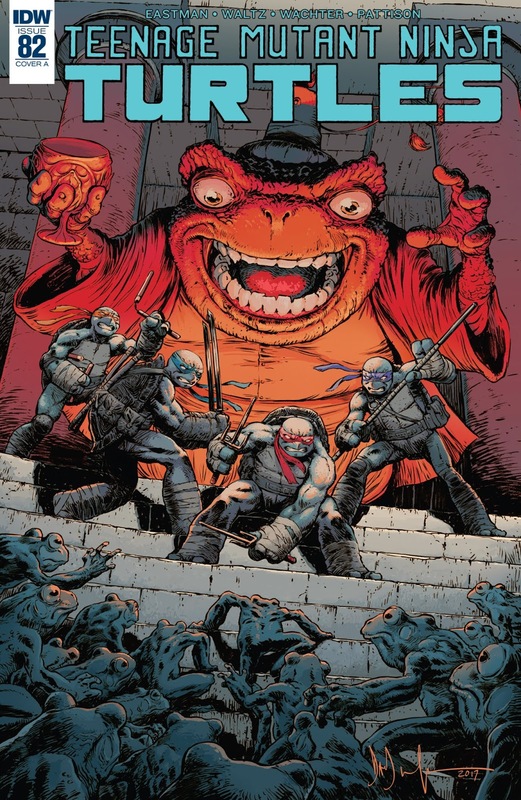 *Lupo and his mob were last seen in TMNT (IDW) #64. 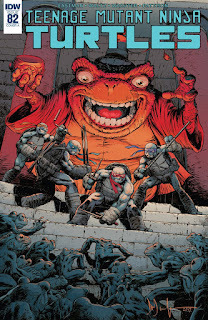 *The Turtles imprisoned and banished Chi-You in TMNT/Ghostbusters #4. *The Turtles directly encountered all the members of the Pantheon (including Manmoth) and escaped the Den of Delights in TMNT (IDW) #72. *This issue was originally published with 4 variant covers: Cover A by Dave Wachter, Cover B by Kevin Eastman and Tomi Varga, Retailer Incentive Cover by Will Robson and Brittany Peer, and Comics & Ponies Exclusive Cover by Eastman and Varga. So far, Rat King has been only a minor entity in this story arc that seems to be titled after him. His presence is what motivates the protagonists, sure, but we're halfway finished and he's only appeared in a couple of pages. I think Rat King had more to do in the Casey & April miniseries than in "Kingdom of Rats". 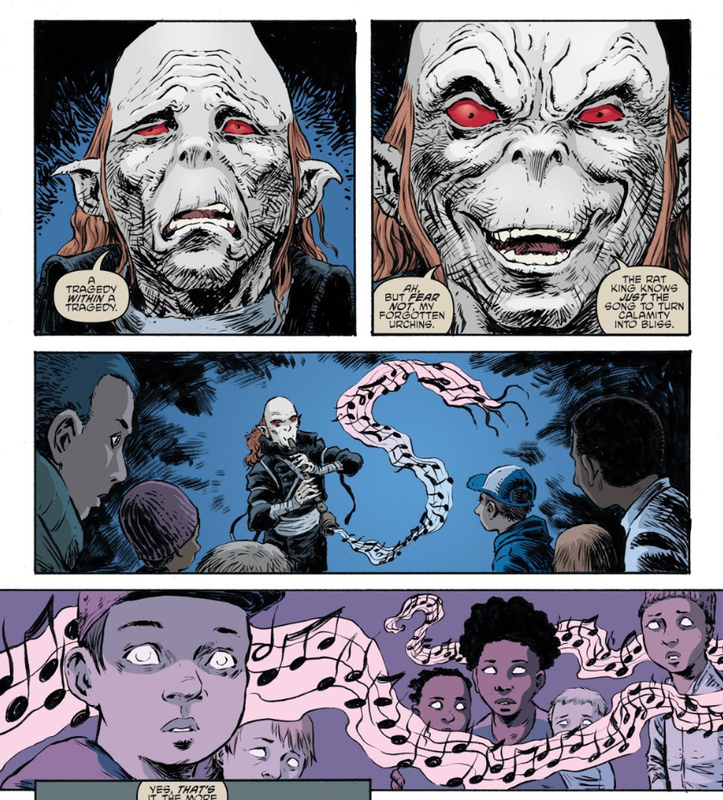 I know the creative team is going for the "ominous buildup" routine, but they've been playing that game with the Rat King since TMNT #36. He's already at Peak Ominous! As a Pantheon-centric storyline, Waltz and crew are at least endeavoring to demystify these characters some more, which has been long overdue. Toad Baron was utilized more as a vehicle of convenience, but at least his exploitation was built upon previous encounters. That said, I didn't quite follow the logic of the negotiations. The Turtles want help in stopping the Rat King, the Toad Baron wants help in keeping Kitsune from resurrecting the Dragon... So, he helps the Turtles in finding at least one of his siblings who might be willing to help stop the Rat King, but what does that have to do with stopping the resurrection of the Dragon? Do they plan to convince the other Pantheon members to help them stop the Rat King and then somehow that overlaps with thwarting Kitsune in bringing back their father? The conversation isn't easy to follow, thanks in large part to the Toad Baron's ponderous and alliterative dialogue, but also the numerous "comical" asides that break up the flow of discourse (Mikey and Donnie talking about the food, Leo trying to keep Raph from puking some more). It's not made clear what the hell one thing has to do with the other. Is it a "you scratch my back, I'll scratch yours" sort of deal? If the Pantheon helps the Turtles stop the Rat King, they'll help the Pantheon stop Kitsune from resurrecting the Dragon? Was it that simple? Because that tedious three-page dialogue sure tried its level best to obfuscate the purpose of the conversation. All that aside, if the end goal is that we get to meet more of these Pantheon members and explore their dynamics, then the ends might very well justify the means. We're at least being promised an action-packed issue where the Turtles fight Manmoth, so that's worth looking forward to. Though if this is a four-parter and Part Three is all about Manmoth, looks like we won't be getting any action with the Rat King until the conclusion. That's a bummer. Other intrigues abound with this installment, as Baxter is now put in a rock and a hard place between his alliance with the Turtles and his forced partnership with Agent Bishop. Then there's Splinter's further consolidation of power in New York, which continues to be fascinating. Also, Jennika might have a crush on Casey, but I don't care about that. Artist Dave Wachter's strengths and weaknesses are mutually displayed in this installment. His style is very detailed and dramatic, with heavy inks that work for the gloomier sequences. Bishop coercing Baxter into a partnership has an atmospheric overlay to it and the bit where the Rat King brings more children under his thrall was nice and spooky. Unfortunately, comedy is not exactly Wachter's forte, so the opening sequence where the Turtles humorously do battle with Toad Baron's servants is intended to be gut-busting, but lacks any animated or exaggerated layouts/expressions to get the wit across. The comedy of the gross food is maybe a little better rendered, as Wachter's highly detailed aesthetic captures the nasty nuances of the feast, but "yucky food" isn't exactly a knee-slapper to begin with. I was hyped for "Kingdom of Rats" when it was announced, but we're halfway through and, to quote Milhouse, "when are they gonna get to the fireworks factory?" I absolutely enjoyed the Den of Delights portions of this issue. Toad Baron speaks in purple prose, but that's always been part of his schtick, and I'm okay with that. But what I really enjoyed was Alberto, Bob and Franz and their adorable attempts at improvised combat, as well as Leonardo's impatience with the nonstop weirdness. Then that maneuver he used to incapacitate the frogs - it superficially resembles the Vulcan neck pinch from Star Trek, but actually strongly reminded me even more of the pressure point attack from the 2012 series episode "Slash and Destroy" used by both Splinter and Raphael. Baxter folded like a napkin under Bishop's threats, but I can't help but wonder if April already anticipated he'd do that and has some kind of plan counting on it. And Jennika and Casey? What if later the two of them have a kid named Shadow?